Way back in the late 1950’s I lived at Didcot in what was then North Berks, (now Oxfordshire), and on a recent trip back ‘home’ I could not resist the opportunity to call in at Pendon to see how it is progressing and whilst there I took some photos to remind myself how good it really is so please forgive the poor quality but I only had my ancient mobile phone with me and they also had to be taken from behind glass! On Summer Sundays, myself and a couple of friends, would cycle the 4 miles to long Whitenham to do a spot of roach fishing near the lock. However it wasn’t always sunny and if it started to rain we would saddle up and head back down the road to what is now Pendon Museum, but was the local youth hostel then. 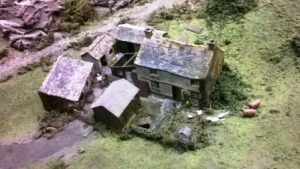 We would go to see and hear Roye England discuss his models and in particular the Wagon and Horses pub which is still part of the exhibit. Roye was a native Australian but he had fallen in love with the British countryside and the GWR’s part in it. I well remember him explain about all the interior details he incorporated and even how he had made the loaf of bread on the pub’s kitchen table from the cellulose in a cigarette filter tip! 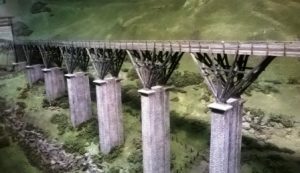 Back in those days the main exhibit was the Dartmoor scene which to us 11 year olds looked massive and was dominated by a superb long Brunel trestle bridge. If we really behaved ourselves then Roye would regale us with a procession of his magnificent locos and stock trundling over the bridge. Although Pendon does not portray an actual place nearly all the models then were of particular prototypes from the area west of Didcot towards Swindon known as the Vale of The White Horse and in his vision would be recreated in one giant model to ‘represent’ the are in the 1930’s. 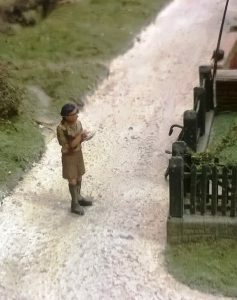 He would use his spare time to cycle the Vale taking measurements and details of properties he wanted to include and as a nice touch he has been modeled doing just that, so look out for him in the vale scene but more about that at a later date. Roye doing the business with his bike against the fence. 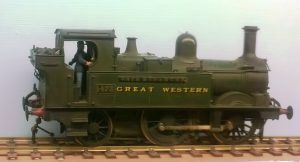 As I mentioned before he would show us the locos and rolling stock built for him by the great man, Guy Williams, who unfortunately we never met but I did buy his brilliant book about constructing 4mm scale locomotives. To our eyes these locos were absolutely superb and compared to our own Triang ones on a completely different level. We didn’t appreciate the niceties of finescale but we knew what we liked and this was it! The Fair Rosamund loco which we locals were familiar with as it was an Oxford engine usually working the Woodstock branch. We were always drawn to the coach interiors and when the lights were dimmed Roye would bring a train to a halt on the viaduct so we could peer inside and marvel at the detail including a Maharaja as one of the first class GWR passengers. 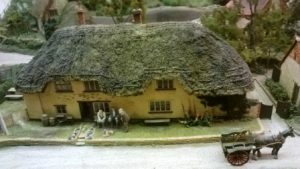 Did I mention that was another of Pendo’s attractions for us it was virtually all GWR and a fascinating look back in time to how rural life was prior to WW11. Nothing much changed for generations but the 1960’s and mass modernisation was soon to encroach and much would be swept away for ever! Nestling under the arches of the viaduct is this impoverished remote farmstead. A GWR fan, or not, this really is a go to exhibit if you are a model railway enthusiast, better than visiting any exhibition and probably cheaper!